Discussion in 'Proposal Ideas' started by musey, Nov 2, 2007. OMG..!! This is a wonderful thread started, though I found it late, but never mind. I would like to share an idea about the proposal. This is the idea I always wanted to have a practical of. This is just wow if I get it.. Mine was close enough but it was in the restaurant so I missed the feeling of beach.. But I got a diamond ring..
Be happy and keep shopping for DIAMONDS.. I purchased my ring from GOG based on awesome advice I received here. Sorry, this video is half English and half Spanish. Basically made her believe we were flying down to DR to have dental work because we are from there and it's significantly cheaper. My cousin has a dental clinic and I had my fiance drop me off to get my procedure (implant). She had a nurse come out and get me with a chart in hand. I had my dad show up at the clinic and and asked my fiance to please go and have fun with her family. Since I planned this well ahead of time, I had her friends plan a girls night out since I would be "recovering"
I even called her sounding sedated when a couple of hours had passed. That moment when my husband proposed me is very close to my heart. Though it was simple but very special for both of us. How could I forget that day, when he planned a candle light dinner for me and it was just like a dream come true..surprise after surprise...then he gave me bunch of roses. And I just had no words to express my feelings.... after that he bends down on his knees and proposed me with a beautiful diamond engagement rings with pave setting ... Ring was absolutely stunning. He told me that he ordered my ring from http://www.eternitybyyoni.com/. He knew how much I admired diamond rings. It was a special day for me that I can never forget!!! My now-fiance proposed almost a month ago and we couldn't be happier! Initially I had wanted to wait until I graduated college to get engaged (I'm a senior) but we realized that waiting for an arbitrary milestone was exactly that- arbitrary! We were in love and ready for the future so we decided to go for it So I told him that I'm ready to be his fiancee and we talked a lot about rings and our future and when/where we would hold our wedding. After being in different countries for over three months, the day finally came that I got to see my then-boyfriend again. I knew he had the ring with him but I didn't know when he would pop the question! He had just gotten the ring in the mail before driving six hours to my house and hadn't seen it in good light yet, so he went into my kitchen to examine the ring. After, we decided he could try the ring on my right hand with my eyes closed to make sure it was perfect (and we were just so excited). After he put it on my right hand he said it looked great and then told me to keep my eyes shut while he put the ring away. When he told me I could open my eyes, he was down on one knee with the ring and said, "Will you marry me, Honey?" My fiancé proposed on Saturday 23rd April, we've been together for 5 years and 4 months. I thought he was going to propose 2 years ago when we visited NYC. We went up the Rockefeller Center & he wanted to wait for the sun to go down. We were hanging around for ages, I thought he was waiting for a magical moment to pop the question. He just wanted to take some panoramic photos. He took me for a helicopter ride, I posted about it on facebook and loads of my friends got excited because they were sure it was going to happen then. And then I thought he was going to propose last year when we went back. Perhaps when we went up the Empire State Building. He said he couldn't afford a ring at the time, but we have been discussing marriage for quite some time now so in my mind we were semi-engaged anyway. It's my 2nd engagement/marriage and his first. He knew I wanted a coloured stone because my first was an 0.24 carat diamond solitaire (platinum band). It was pretty small! But this was 2004 and my ex and I were quite young. So for this ring I'd been looking at sapphires for quite some time. We'd had a look at the high street, I'd been pinning like mad (pinterest). We'd seen some pre-loved rings at an independent jewellers near where we live and he'd started looking at auctions as well. He asked me if I'd mind having a second hand ring. Then leap year came along and I proposed to him! He said yes but he was "annoyed" that I did it first because he wanted to propose to me. So we were only semi-engaged. (although I thought we were engaged in all but the ring for ages since we've been discussing marriage for years). In the Easter school holidays, we visited Worcester (UK) with his mum (who was visiting from the North) and on our way to the cathedral we looked in the window of an antique shop. We saw it, I loved it. We visited the cathedral and all I wanted to do was go back to the antique shop. Afterwards when we did go back he went inside to ask about it, and I got to look at it and try it on. He said it was a little over budget and he'd have to save up. But last week he woke me up with breakfast in bed, and my ring attached to a poem inside my teacup (which had no tea in it thankfully). Create a "Proposal Bear". With hundreds of Build-A-Bear Workshops around, getting a hold of one won't be hard. Stop by your local Build-A-Bear and pick out a bear. Before stuffing the bear you will be given the option to insert a message box. Select a personal message box and record your proposal. Place the box inside of the bear and then continue the process of it. Once your bear is created you can dress it how ever you would like to but keep in mine they do have wedding dresses and tuxedoes. 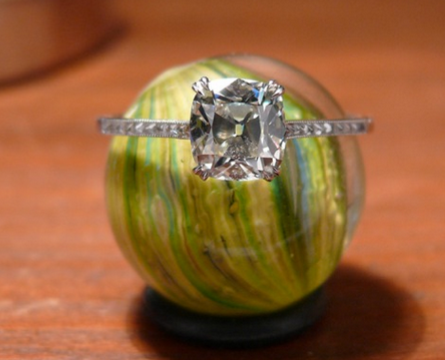 This way you will have a romantic proposal along with a keepsake! If you and your mate like to sing then go out to karaoke night and sing her a romantic love song. At the end of the song propose to her. Not only will it be romantic but it will be in front of all those people. How could she resist? Find yourself some glowing stickers, stars, or paint. Write your proposal message where ever you plan to be that night. For instance if you are having a romantic dinner a home, simply write the proposal above the bed on her ceiling. Stand out side her door and wait with the ring. Once she turns the lights off it will be moments before she comes to find you. If you are camping write them in the woods on a trail. Take her for a nice walk and stop near the spot of your proposal. Slowly point her attention that way! She will be left glowing with love!
. Take the engagement ring and tie a thread to it. Tie the other end of the thread around your finger. Tell your partner, "I have a present for you, but there's a string attached." It's one of the most beautiful rings I have ever seen!!! Congratulations! My story is not as romantic as a lot of other stories out there, but it certainly is unique. I come from a big family. I have seven older sisters and they were all married before me. When the last one got married, when it came time to throw the bouquet, she stood up, walked over to where I was sitting and handed me the flowers and said, "You're next!" Just like that, my boyfriend went down on one knee and proposed to me in front of everyone. To this day, they both insist that they didn't plan that, but I have my doubts. I said yes, and the next year we were married. I woke up one morning, my now husband was still asleep. I staggered downstairs and into the bathroom to brush my teeth and wash my face. So I'm brushing away and humming, when I glance in the mirror and notice a diamond on my left hand that I KNOW wasn't there when I fell asleep. I ran upstairs and said "HEY!" and he woke up with a start. I was shaking and going "What's this?" He was all sleep disoriented haha and I was frantic. He told me to come sit by the bed and said. "Good morning, darling. I love you. You are the woman I want to see next to me every morning when I wake up. Will you marry me?" Then we had a celebratory breakfast at our favorite diner. It was low key and special. I would have had a panic attack. That is sooo sweet!!!!!!!!!!!! I'll start. Though his proposal was very simple, it was absolutely perfect because of how in-the-moment and heartfelt it was. My then-boyfriend and I had been living together for about nine months when he proposed. I knew he had the ring, but the rest of his plans were a mystery to me! I had been playfully asking him about said plans, which of course he wanted to keep me in the dark of. He said he had it all planned out and that I just had to wait until that perfect moment he'd chosen. The next morning, he took our puppy for a walk, and when he returned, he couldn't hold himself back anymore. He let the dog wake me (he has a morning "ritual" where he climbs all over our chests and licks our faces/arms/whatever he can get to--very, very cute). I woke up to an exuberant puppy, and my fiance-to-be kneeling at the side of the bed. He told me that while on their walk, they'd had a "very meaningful conversation" (he was joking, of course) in which he asked our pup if he thought he should just ask now, to which the he'd gotten very excited and jumped all around yipping! So, right there in bed, at the insistence of our puppy, he said the most wonderful things I've ever heard and asked me to spend my life with him (and the dog, of course! ). It was perfect, because I felt like he had truly been moved to propose, instead of just having a plan and following through. It was the most private, sweet, and meaningful moment of my life... and I've never felt more loved than on that morning, with my hair mussed from the pillow, morning breath, and not a stitch of makeup on my face. Just me. My DH had been married once before. I had been engaged twice before, but never married. Between the two of us, we have 6 children (he has 4, I have 2; 4 boys, 2 girls). My first proposal was odd; my mother had given him my Great-Grandmother's engagement ring to give to me (not really sure why-she never liked him). I was in my Senior Year of College, and he came to visit me. There was no real thought into anything, he just pulled out the ring, asked me to marry him, and that was it. It just felt very flat, and muted; not special. After 2 years of "trying to make things work", I ended the relationship. My second proposal wasn't really a proposal. He took me to a jewelry store, picked out a ring with me, asked my mother for permission (she declined-she didn't approve of him), not long after, things between us went South, and I ended the relationship. I ran into the jeweler who had met with us, a while after, and she told me he never came back for the ring, eventhough HE told me he DID. DH's first proposal wasn't a proposal at all. They discussed getting married, agreed they were going to get married, and made their announcement to their parents. She went out without him & bought her engagement ring. He never had the opportunity to do anything. Since my DH had never proposed, previously, he wanted everything with me to be different (and so did I, with him). We got to the cabin early, so he took me to the lake near the cabin "to kill time". We walked along the beach, near the lake, and we strolled over to the bridge that stretches across the lake, where we discussed our future, and expressed our excitement about starting our lives together (we discussed marriage, a lot). I promised him that no matter what, I would make his dream come true; he would have his cabin in the mountains. I poured my heart out, and he confirmed that everything I said was equally reciprocated, but I noticed that all he seemed to be able to do was gaze into my eyes, hug me tight & tell me how much he loved me. This pattern continued for some time, and I was so confused...lol! He would just stare at me, hold me, and say, "I love you." Finally, he got choked up, and couldn't hold back the tears. Honestly, I felt horribly ill; I thought he was going to break some horrible news to me. I seriously thought something was terribly wrong because he seemed so upset. He took my left hand in his hand, reached into his pocket & dropped to one knee...choking back tears. I stood on the bridge in absolute shock. Through tears, and whispered breath, he asked, "Will you marry me?". I could barely speak, and I was crying, but I'll never forget my response, "I will marry you, today, tomorrow, and every day after...for the rest of my life. I would be honored to be your wife." As it turns out, I'm a "poet & didn't know it"...lol! He had opened the box, but I closed it because I just wanted to focus on him & soak in everything he said; the way he looked; the way he smelled...I just wanted to absorb that moment & make it a part of me. The ring was a distraction...lol! Once the proposal was over, I helped him up, and he kissed & hugged me. He gave me the box, and the whole time we stood there holding on to each other, all he could say was, "Please don't drop it. Please don't drop it"....LOL!! I had a death grip on that box...it wasn't going ANYWHERE! I gave him the box, and asked him to put it on my finger; it's not a "perfect proposal" until he places the ring on my finger. Plus, if anyone was gonna drop it, it was gonna be him...lol! As soon as the ring was on, everything changed for me. I felt more alive than I ever did, before. I knew he was the one...third time was a charm. It wasn't about the ring...it was about HIM. The fact that he had done the research (at times, with my help), and thought out what he wanted to do, and how he wanted to surprise me...just all of the effort he put into it just for me...I felt like I was on top of the world, that day. It turns out, he modified his plans, and what he wanted to say. Apparently, he proposed 2 days earlier than he had originally planned, and everything he had intended to say flew right out of his head because he was so moved in the moment with me on the bridge. Frankly, I love everything about his proposal, and I cherish it even more knowing I was his first (and last). It was simple, and incredibly beautiful. It was Autumn & the leaves on the trees were beautiful. He found a beautiful, deep red leaf, and gave it to me. He knew I'd want to take photos, so, off we went for a photo shoot at the Lake! We met with the agent at the cabin, not long after. It was nice, but needed a lot of tlc. We passed on it, but we are still actively looking for a cabin in that area, near the Lake. In July, he took me back to Laurel Hill Lake. The conditions, that day, were very reminiscent of the day he proposed, only warmer. I was able to recreate the images I had taken the day of the proposal, on the bridge. It was such an amazing day! Returning to the Lake only intensifies our desire to plant our roots, and live out our lives right where it all began. The love of my life made my dream come true. I am determined to do the same for him; to fulfill the promise I made to him, that October afternoon, on the bridge...the day I promised him forever. Dated a few years...broke up for a few years. He now lived 3 hours away. Reconnected....3 months later he blurted out that he wanted me to move and be with him. I blurted out “ not without being married,”. He retorted I would not ask you to do that!” I responded...” so....did you just ask me to marry you”? YES!! Oh......then I left the room in shock”. Lol! I did not give him an answer....I accepted a few days later..6 weeks later he had the ring....We wanted a do_over proposal. On his bended knee...He asked, I accepted and then he gave my the ring. Perfect! 2002. Well thank you spammer for bringing this thread back to the top b/c it gave me all the feels. Wonderful stories.